Why is the Almighty so taken with the most insignificant things that he takes such exquisite care how he places and uses them? Why does He act as if the greater is the lesser, the ordinary or even the unattractive is the more appealing to His eye, and the powerless is the more useful to Himself? If the answers were more plain than they are, fey creatures such as Tesedahh, an "angel," might not be so bemused at their somewhat dull personal characteristics and feel so in the dark concerning their very purpose in being created. Somewhere in a place called heaven a newly created "angel" began to wonder. What was he? No one thought to tell him, because it was not necessary to know, and in time he would discover all that was needful. For the first period of his creation, it was only needful to look about and test his senses amidst the glories and degrees of glory spreading out before him. At the first, very near the nativity of his consciousness, he was aware of kindly presences, even before he saw them standing a short distance from him on either side of a curving space of softly glowing light. Before he knew he could speak with the part of his face that was his mouth, he could speak to them with his mind. Thoughts formed in his mind, very simple, but gaining meaning and complexity, informing him and carrying him from point to point as he was able to absorb what was imparted. He was learning! After a bit he realized he was being taught, and he listened and learned, for his consciousness yearned instinctively to inform his unformed, wondering spirit. Tsedahh, as the moment came, turned to the greeters. They were, he saw now, wonderful beings, with stunning beauty and majesty. He sank to his knees before them, waiting for whatever they were there to do to him. Tsedahh was overwhelmed. “I have been given this wonderful thing called name?” he thought. As for the meaning, he could not take it in. To have a name seemed the greatest good fortune. Someone had been so good as to give a name to him, which began working in him the moment it was uttered, giving him meaning, character, and purpose. But who? Why? The natal greeters, sensing his confusion, took his hands and gently drew him up. One of the greeters smoothed Tsedahh’s rumpled, sandy hair, holding out a mirror. Tsedahh, astonished to see his own image, did as the greeters showed, and he took delight in smoothing his hair, too delighted in it to begin to compare it with the hair of others that shone far greater and showed much finer texture. Another greeter held out a robe. Tsedahh was shown how to dress himself. Everything that he needed to know about hair and robe shown, they took his hands and drew him slowly down the great curving space, which changed gradually and began to be filled with shrubs, flowers, and walkways. In the distance rose little hills of various light colors, with sparkling clouds over them, but they must have been far off for they did not come closer though Tsedahh walked attended by his greeters for quite some time. Finally, they stopped where the ground gave way and sloped into a spreading valley. The little hills, he saw now, were mountains that climbed the sky. And in the valley were winding rivers, and tall spires of glistening color, with many-colored trees and and flowers, allindividually fragrant. The scene was so breath-taking that Tsedahh had to rest--that was why the greeters stopped. Apparently, it was such a place for resting, for the meadow was made very pleasant with a multiple-tiered dancing spring of water, hovering birds and butterflies and many fragrant flowers. Tsedahh did as his greeters did, and seated himself on the thick growth of flowers,which were not crushed but easily supported them. By this time a question had grown to almost a burning in Tsedahh’s breast. “Whose am I? Who has made me?” burst from him. Tsedahh was dumbfounded. Evidently, a Great Being had made him, to have made so much as he could see spread before him. These greeters, too, they could not be so great as this One! But the discovery was overwhelming, as he began to grasp more implications as he gazed upon his surroundings, realizing that there were worlds whirling above and that the great mountains in the distance were succeeded by even greater ramparts beyond. At that moment Tsedahh tasted Infinity, and his whole being thrilled and gasped at the same time. The greeters were most kind and understanding, for they held hands and arms lest Tsedahh’s spirt whirl off and burst with too much revelation. On the other side of this revelation lay Terror, which was holy if guided into the right channel, and the guides knew just when to stop and when to go on. Knowledge was not wisdom, and only wisdom could enlighten and sweeten terror--and wisdom was not something Tsedahh could learn in the first and second stages. When it was judged time, three of his guides drew back away, and only one--Nakon--accompanied Tsedahh on his journey--for it was a journey to the “City of the Great King” which lay somewhere on the crests of the far mountains. There was no hurry getting there, Nakon told him. They could stop and rest any amount, just as Tsedahh pleased. And Nakon knew many things, showing Tsedahh many marvels along the way, and how to swim in the pools and rivers and play with the fishes, great and small. Other times Tsedahh simply stood and enjoyed the chiming music that came down out of the clouds, producing intricate melodies that his spirit could scarcely comprehend. For the first time Tsedahh felt his heart turn over. He had taken Nakon’s loving and charming presence so for granted, that the thought of their parting had never occurred to him. His eyes widened, blinked, and he “ wept” with sadness for the first time in his existence. Tsedahh felt ashamed after he had shown sadness, for he was just a child in his spirit. Nakon put his arm around him, and this assurance strengthened Tsedahh. Not explaining why they must part, Nakon led Tsedahh gently onward. 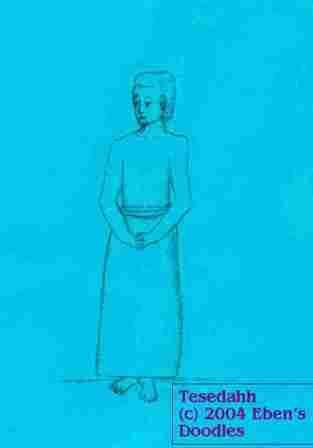 Gradually, Tsedahh grew accustomed to the thought that had provoked his sadness, and he trusted Nakon to lead him. More and more Nakon told him about the Creator God, and then began to explain the Names by which God was known to all his creatures. In this stage Nakon was joined by others, who introduced themselves and taught Tsedahh and then departed. Sometimes the two met large convocations, which were assembled for various purposes, and they listened to what was said and then continued on their way to the City. Tsedahh’s wonder and amazement grew. All he learned only made him want to know more about his Creator, especially because He was the source of all life and light and goodness and beauty. But not all he learned was pleasing. There was, for instance, a “War” being fought against “enemies,” a war between Light and Darkness, Righteousness and Unrighteousness, Good and Evil. What did all such things mean? Vast events and powerful forces, they bewildered Tsedahh and seemed too overwhelming to grasp with his mind. It happened just as he said, that the real choice lay with Tsedahh’s heart, not his mind. The most splendid being Tsedahh had ever seen appeared, followed by so many others that the whole valley filled with the vast host, and there still wasn’t room enough, so that many flew upwards on the winds and lay suspended there looking down. “Is this not the most wonderful Creator the Elohim?” Tsedahh asked his mentor. Then Nakon retired, leaving Tsedahh to his fate. Tsedahh was confused. How could someone so glorious not be the Creator? Seeing the multidudes throwing themselves down, hands outstretched, praising the Light-Bringer, Tsedahh was about to do the same when he saw Nakon holding to a tree, keeping it between him and the spectacle. Still wondering, Tsedahh was standing when the glorious Keeper of the Fiery Stones passed. An attendant saw Tsedahh and flew at him. Tsedahh began to blink his silent, moistureless tears, feeling dismayed that he had done something greatly wrong. Hands seized Tsedahh in a crushing grip and held him off the ground. That one violent act was enough for him to decide on which side he would always stand. As if he were an echo, Tsedahh pointed toward the object of the vast congregation, the towering being crowned and clothed with revolving starlike jewels, and cried, “Who is this?” A crowd soon collected and looked at him with amazement. “He is too small thing, to be asking so so great a thing! “ observed a leader in the group. “But numbers are needed to face Michael, so shouldn’t we see if this one will join us?” someone asked the leader. “Him?” the leader snorted. .
Tsedahh was dropped like something both inconsequental and distasteful. And then the mighty one that spurned Tsedahh strode off, the others quickly following to rejoin the passing throngs, leaving the matter unexplained. Though having made his eternal choice, Tsedahh also felt passed over and rejected, and he blinked with sadness. Finally, when all had gone, Nakon ceased hugging his tree, returned, and took Tsedahh’s hand. His face showed great relief, not for himself but for his protege. He was glad the Deceiver was not going about as formerly, stirring the pools with a golden staff and causing glorious images of their “furture glorious estates” to appear that had seduced so many of the brethren and captured their allegiance. Continuing the journey, Tsedahh was taught again. He learned about the orders of created beings, and how one of the highest order had rebelled against the Creator and seduced many others to join his cause. No one knew yet how this War would go, for the Almighty God had not seen fit to crush the Light-Bringer with His power. Later, after they reached the City that was being built in the high mountains, and Tsedahh had been taught his work and was active in helping to build many rooms in the palaces, news reached him via Nakon that the rebellious Light-Bringer and his army had suffered a crushing defeat at the hands of Michael and his army. Since rebellion had cost him his place in heaven, the Light-Bringer and the Fiery Stones, together with all supporters, were cast out of heaven. As Nakon, assisted by others, spoke these truths into Tesedadah’s dawning understanding, the child matured into a man within him. Yet he had suffered a hurt, and he could not heal it. Despite Nakon’s explanation, having been told he was “small,” he looked around at the others and saw that they were, indeed, taller and impressive in form. It wasn’t that his order of beings was different, for all the orders varied in garments, majesty, ability, and responsibility. Rather, the chief difference lay between him and the others in his own order. It was undeniable. They were bright, he was dim. They were tall, he was short. Sometimes he wept, but they never blinked with sadness as he did. They were--it went on an on, how small he was within his own kind. Nakon said he was meant to be that way, but why? Even Nakon could not tell him. It did not help when they were joined eventually by a growing congregation of strange beings, “humans” that had been born on the terrestrial plane called the Twin Earths. It was for these small, weak-appearing beings, Tsedahh was given to understand, that they were building the City. How strange! It was called the “City of the Great King,” yet these creatures from the Earths would live in it when it was finished! Could anything be more strange? Yet things thereafter got even more strange for Tsedahh. Until then he had not given much thought to his name. It was unlike all the others--and no one could tell him the meaning of “Hunter of Food,” but he had many other things to occupy his thoughts. Yet when Nakon came to him, acccompanied by many mighty angels of the highest degree, Tsedahh sensed his prospects were about to change dramatically. There was no question concerning the matter, for the greeters and guides from the second heaven had brought a robe, and it surpassed in fineness and glory every other garment in the third heaven, and it was placed on Tsedahh. Even with such a garment, nothing could disguise the smallness of Tsedahh, and the beings that accompanied him towered over him. As he stood gazing up at them, the whole venture of a royal audience, a call to the Court of the Creator, was just too much--he broke and wept actual tears there in the sight of thousands of those working with him in a city that stretched, upwards and outwards, for a thousand, three hundred miles. When he had finished, the waiting guides turned, giving him the words that he needed to travel with them. Instantly, when they formed in his mind and he had given assent, they carried him from that heaven, and the next thing he found was that he was standing with his guides in the outer courts of the second heaven. He found that the multitudes of beings here were of orders he had not even seen in the third heaven. Some were the most fearsome beasts in appearance. But his guides led him by the hands so that he was not afraid of anything, and everyone gave way as they proceeded directly toward the Gates that opened to the Throneroom. Tsedahh, feeling painfully dim admidst so much splendor, would have shrunk back if he had not been led by such great guides as his. Michael was the name of the one on his right. Gabriel was the one on his left. Worlds revolved slowly above, worlds made up off clustered stars, and these were choirs, singing almost continually. Their radiance and music were overwhelming to Tsedahh, and he felt a growing terror of the glories ahead, which lay on the other side of the Gates. The Gates themselves were like red crystal, only they were living glories from which a golden light shone--and they were guarded by the most fearsome beasts. Four in number, one was like a lion, the second a calf, the third had a face like Michael and Gabriel together, and the fourth was an eagle, and all flew continually, with six wings. They climbed the steps, and the music and light became greater and greater, and then the Gates themselves began to part as multitudes threw themselves down before the glory that came pouring through. It was like plunging into the fiery heart of a star that covered all the horizon with its majesty as Michael and Gabriel conducted little Tsedahh into the presence of the Most High God. Just beyond the gates, in the Presence, rose the golden Altar of the Martyrs that mounted up by the highest moutain, from which fire and incense would rise continually before the Face of God, and which also was guarded on each side, this time by four horses with heads of lions spewing forth fire and smoke and brimstone. The horses had tails like serpents, with biting heads. And mounted upon these beasts were four warriors wearing breastplates of fire and of jacinth and brimstone. Even these wonderful and fearsome beings could not stand the radiance, and the Majesty was clothed with huge dark clouds, over which shot rays of His pure white and golden glory. Somehow Tsedahh was not consumed, trampled or bitten, though his hair turned purest white and he shone like a tiny, bright candleflame between the mighty hands of Michael and Gabriel. At last he would meet his Lord God Creator, the Elohim! was Tsedahh’s only thought. He could stand no longer before the glory of God, and neither could Gabriel and Michael, and they fell down. If Tsedahh had felt himself “too small” before, what was his feeling before the Almighty, Whose glory he now saw? He now understood something. There was nothing that was not “too small” before such greatness and glory and terror. Even Michael and Gabriel were as leaves shaking in the wind. Words formed in Tsedahh’s consciousness. The next thing Tsedahh knew was that there was a thin strip of cloth, a ribbon, glowing yellow in his hand, and then Gabriel and Michael led him from the presence of God. So overwhelmed was he by the charge given him, his own feelings of insignificance nearly crushing him, Tsedahh scarcely noticed the Crystal River of living waters flowing from the Throne, and the twenty four elders seated on golden thrones, and the flying beasts, and all the other wonders that were in that place. When Michael and Gabriel left him standing beyond the Gates, it was an event that Tsedahh could not yet comprehend. Something had changed in the heavens in preparation for this event, which had darkened the second heaven and stopped all the choiring and praise for a season. Michael and Gabriel knew the second heaven when it was full of celebration, and even though Tsedahh thought it was glorious, it was really very subdued. Smokes and fire had issued from the Throneroom, and ominous silences had seized upon the whole heaven--then this calling of the Ribbon-Bearer! A special tree was being selected as well, and the mission was given to the Ribbon-Bearer to find and mark it for cutting down. A tree for what purpose? The first and second and even portions of the third heaven were all wondering about this tree’s possible significance. The heavens contained every sort of wonderful tree, so why should the Twin Earths have anything better? No one could answer that. Yet the Ribbon-Bearer was to go and find the tree that surpassed anything in the paradisal forests of the heavens--and for what purpose? No one--except perhaps Gabriel and Michael--knew. Gabriel and Michael stared at the Ribbon-Bearer, who in turn felt so inadequate to the task that he couldn’t begin to say so. He found it impossible to stand after what he had seen and sank to his knees. And he had not the slightest idea why he had been chosen. Perhaps, his two guides were thinking the same, for they stood, their eyes blinking, gazing at him for quite some time. How was he to find a tree on both worlds? They said nothing to his unspoken question. Now Michael, leader of the warriors of the Most High, knew many things, and yet he was surprised when it did not go exactly as he had thought. They thought they would be accompanying the newborn, but Power restrained them from joining the launch. 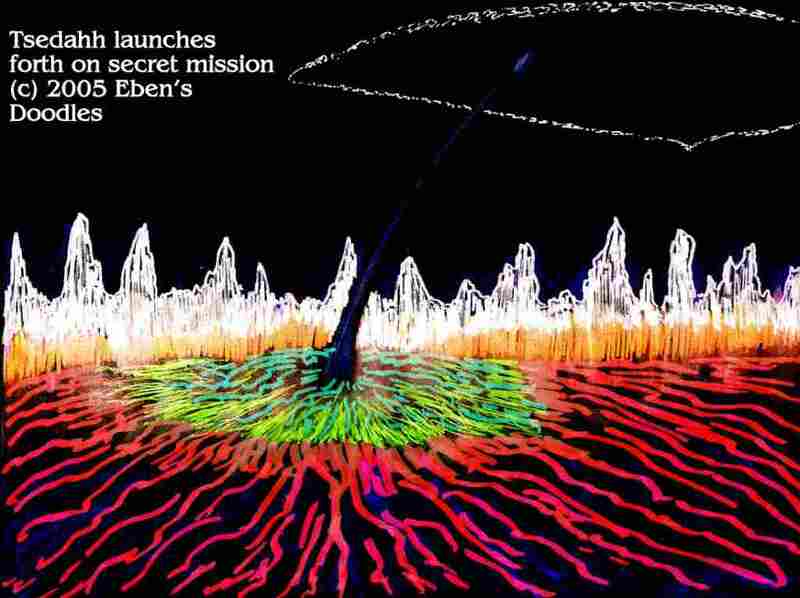 Michael held the Ribbon-Bearer in position for the launch, which then began the count-down in Hebraic letter-numbers recited rather thunderingly by Gabriel who stood nearby the launchpad. 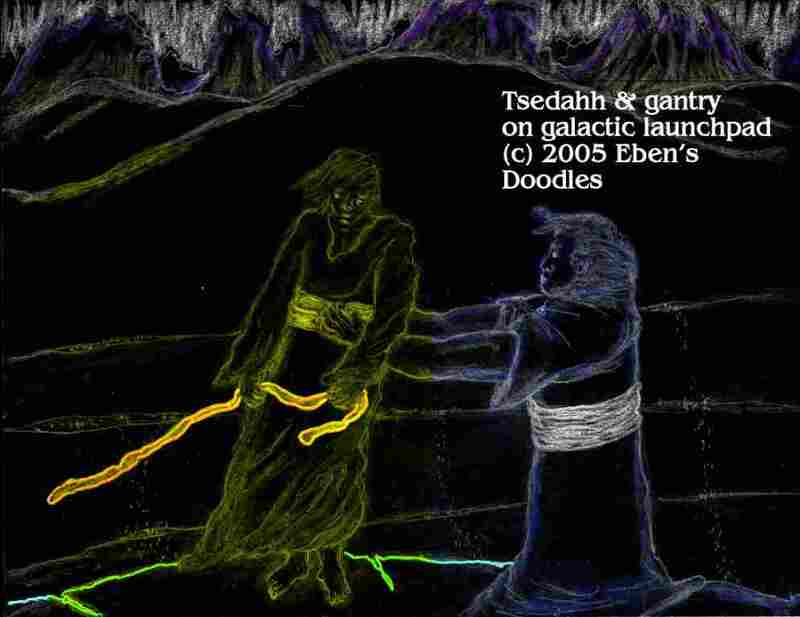 Tesedahh's launch seemed to be a success, as he quickly vanished from view of heaven and his now retired gantry, Michael. Once Michael and Gabriel were free to soar aloft, they had no sooner left heaven when their course was deflected from the pathway to Earth I, and Tsedahh was swept away toward the Gates of Earth I and II, his ribbon of office clutched tightly in his hand. As the Ribbon-Bearer vanished amidst the stars of the terrestrial fourth heaven, Michael and Gabriel, receiving no power to go ahead and thus prevented from following, turned back. If they expected further instruction when they returned to the Court, they were disappointed, for nothing more was said. There was, for a space, utter silence in the second heaven while poor Tsedahh whirled seeemingly lost in space. Would he ever find his destination? On Earth, thirty years, almost thirty three years, had passed since the Birth of the Son, which had occurred marvelously as only the Father and Spirit could do it, simultaneously, on both Earths. What could a mere tree mean to the Father? Everyone wanted to know, of course, for they sensed it had something to tell them of the Elohim, from Whom they all drew wisdom, knowledge, and happiness. The Son had been born for one purpose as a human being--to take away the sin of the world as a perfect sacrifice. For that purpose He was even now preaching and teaching the kingdom of God to all who would listen--again, simultaneously, on both worlds. This stupendous plan was beyond wisdom--no one had guessed Elohim would do this and what would come of it. But why should a tree be involved? Everyone knew that the altar before the Temple of God in Jerusalem was the only legitimate place of sacrifice for God’s people. As to this and a myriad of other questions, Tsedahh might know something--but he was out of communication with everyone except the Spirit of the Almighty. 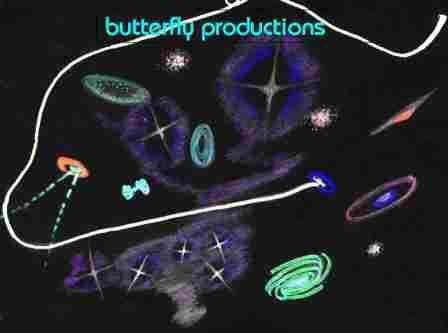 The appointed Ribbon-Bearer circled the Universes faster, much faster, than light. His ribbon had grown and was a soaring flame that stretched out behind him for thousands of light-years. Around and around, descending spirals took Tsedahh in his appointed course to the quarantined sector where the Gates of the Twin Earths were located, each heavily guarded by loyalist forces since the destruction of the Bridge of the Titans. Not permitted to enter the Light-Bringer’s domain, the second Earth astonished Tsedahh when he flew toward it. He could not fathom why he should be sent to so dull and insignificant a place to find the Lord Creator’s tree. Yet that was where he was to go, evidently. He found himself slowing in flight and then stepping down toward the approaching surface. The whole flight to Earth was like a dream, but the ground he felt beneath his feet was real enough. He felt every bit of it, and the wind and sun and the sounds of life around him, it was all very real. Though Earth lacked the incandescent splendors of heaven, it was charming in a dim-lighted and dim-colored way, like a little clump of brown and spotted mushrooms he nearly crushed underfoot as he walked down a path in the woods. And, most significant of all, somewhere down on the surface walked the Second Person of the Elohim, the Anointed One, Yeshua. Reaching the surface, Tsedahh felt it, and was surprised how soft it was. He moved both on the surface and above it, avoiding the rocks by flying over them. Tsedahh felt he could not be very far from the tree, for he felt it growing stronger to his senses as he continued on the path. Finally, he was certain it was near. The sense of the tree was overwhelming, though he couldn’t yet decide which tree it was. On all sides grew mostly tall pine trees, and there were wild olives, terebinths, and oaks, all large in size. But which olive, which pine or oak? He looked at each, but nothing seemed right. They were all tall and noble, but he felt nothing right about them. As he turned down the path he nearly passed a tree, which wasn’t much of a tree at all. Apparently, woodsmen had recently passed that way, for they had sawn into it, then decided it wasn’t worth the trouble, then left it. Just beyond lay the stump of a once mighty terebinth. Immediately, Tsedahh felt he had gone too far. He turned back, and his eyes fell on the half-sawn tree. The ribbon leaped in his hand like a living thing, and he did what he felt he had to do. He went and circled the tree with the ribbon, though he could not understand why this was the chosen tree, it was too small and spindly. There was, moreover, nothing beautiful about it. The leaves were ordinary, and he saw no fruit. The branches were not straight either; they all bent like bows. Why, then, was it the tree for the Son of the Most High? A blackbird with eyes like polished jetstone hopped to the end of a near pine branch that would have served as a board, it stuck out straight and true. Tsedahh looked up and saw ot was a great, strong, beautiful tree. The sight made him wonder if he could be doing right. Before Tsedahh, hesitating, could consider the pine’s attractiveness and regular shape over his own choice’s obvious short-comings, he heard voices. People were coming! Since he had no experience with them, and had seen them only from afar, he stepped off the path. Two sweating woodsmen, shouldering axes, came up the path, then paused for a rest. Poor men, they had to carry out everything they cut, having no donkey, and so they earned little and walked much. One looked and saw the ribbon, then called to the other. They both went for a look. The woodsmen set to work and soon had the tree down, but all they got for their effort was two middling boards, which they shouldered and took away. The curious blackbird flew off squawking, leaving Tsedahh. He went to where the tree had stood. The ribbon too was gone, stuffed inside the garment of one of the men. Heart sinking, close to tears, Tsedahh stood looking at the stump, wondering if he had made a mistake. He had marked the tree, never expecting two men would come right away and cut down God’s choice. Now what was he going to do? He had lost God’s tree! And, the thought could not be denied, whatever purpose intended for the tree was now in jeopardy. Could he find another of the same kind to replace the stolen one? Tsedahh looked around for one just like it, but after much searching he found nothing. There was only this one, apparently. Well, there was nothing for it, he decided. He had to get the tree back somehow. He started on the path the woodsmen had taken. It led him to a poor village not far from Shechem, but he didn’t dare enter, so he climbed round it. The men had gone directly out, carrying the two boards, and soon Tsedahh saw another cluster of houses clinging to a steep hill beside another just like it. This was large enough to be a town, and two well-travelled roads led to it from the north and south. Here Tsedahh began to feel safer, for he could walk in the dusty road and the dust thrown up by passing donkeys and camels soon covered and obscured his conspicuous brightness thickly (for on the dim Earth, he shone much more in contrast than he did in heaven). Pulling his robe up over his head, he walked bent over like he saw some old men missing a hand or a foot from some accident begging for bread beside Jacob’s Well. No one gave him a second glance as he climbed up into the town. Looking ahead, he saw most of the people gatheed in the busy marketplace. Lumber lay in a big stack off to one side, and so he made his way there. He came up just as a wagon was being loaded. His heart gave a lurch as he recognized the woodsmen. One--who possessed the renowned Samaritan agility of tongue in bargaining against shrewd Jews and Ishmaelite traders--stepped to the buyer and pointed out two beams they had just handcarried to town. “No, not that, but a sign just the same!” they replied equably, suppressing the natural urge to spit right in the trader’s eye, then yank out his holy beard and feed it to the nearest goat. One woodsmen pulled the ribbon from his garment. It had no dust on it. It shone like something fallen from the sky, it was so bright, and people cried out in surprise and ran forward to look at it. A local Samaritan woman of some means wanted to buy it on the spot, but the woodsman thought he still needed it to sway the buyer’s judgment so he held on, waving it in the air. The buyer, relenting, gave his Libyan slave a nod, and the slave loaded on the two beams into the wagon with the cedar and oak. He flipped the woodsmen five Roman asses, which was half a silver denarius, and they scrambled for it without further protest. Since that would be pay for half a day of labor for one man, they were satisfied, having spent far less time getting the wood. With five Roman asses they could go and buy bread and wine in the town’s tavern, giving them a chance to tell everyone there how they had put it over on a Jewish trader, selling him worthless lumber no builder or carpenter would want. The woodsmen bowed, and the wagon started off from the market, with Tsedahh, appalled, following hard behind. He never did see what became of the ribbon. In the same manner they reached a city high in the southern mountains of Judaea. Covered with the wagon’s dust, Tsedahh succeeded in entering Jerusalem without trouble, and the wagon continued on until it reached a marketplace. There a man in a tall, red turban and a tasselled and green-striped yellow robe stepped to inspect the load, and as a buyer for the Temple he took everything but the two beams from the dogwood tree, which he judged inferior to the other specimens in strength and utility. “Just for the holy Temple I’ll throw those two last prime boards in with the others for only five denarii more,” offered the wood dealer, hoping to recoup something at least. But the temple buyer said nothing and walked away, so the dealer was left to get rid of the wood somewhere else, since the day’s business was over and people were closing up shop everywhere according to the city laws governing trade. Not wanting to risk it, but desperate to get at least two or three denarii, the dealer moved on and the wagon pulled up to the watchmen-attended gates of a mighty fortress next to the much vaster structure, the platform and Temple built by the late Herod. Guards stood at the Roman fortress’s gates, preventing anyone from walking or riding in. “Good Jewish wood for Roman crosses, noble sirs,” he called out cheerfully. The wood dealer and his slave were questioned, then allowed to pass. Tsedahh stood outside the gate, waiting, and before long the wagon came rattling out, without the wood. He could not think what, and night was dropping fast. He hadn’t expected such a thing as night, and it grew so dark that he couldnd’t see through the gates, which closed anyway for the night. Shut outside in the street, Tsedahh clung miserably to the opposite wall and wondered what he should do. In his wet, filthy garment, Tsedahh took off soggily walking, he had no idea where to. He was totally unaware that his dimness of heavenly glory and his physical shortness were standing him in good stead for once, helping him blend in with the race of humanity. Not so, for the likes of Michael and Gabriel. They would would have been immediately spotted. The entire city would have erupted, The heavenly visitation surely furnishing cause for zealots inciting a riot against the Romans, with the Romans retaliating with a a slaughter of the Jews. Perfectly acclimated, Tsedahh trudged woefully along level, ramrod-straight Roman-style streets as well as stomach-upsetting up and down, twisting Jewish lanes and byways. People catching wind of him pinched their noses and shook their heads in disgust. Anyone looking at him now would only think he was a homeless beggar, a common sight in the streets of the Holy City, particularly when it was thronged with pilgrims to the various Festivals. This happened to be the Passover season. Streets were packed with humanity during the day and at night there were plenty of left-over of the rough sort roaming about, looking for some advantage, so no one got much sleep. Fortunately, Tsedahh needed none, and it was just as well he kept moving, otherwise he might have been set upon by robbers, even in his stinking robe. As soon as he dared, however, he crept back to the environs of the Antonia. If the sawn tree left the fortress, he wanted to be there to follow it. As he neared the fortress he heard an uproar in the place of judgement called the Pavement by the Romans, and the Jews the Gabbatha. It was a broad open court just beyond an impresive arch where the Roman procurator, visiting the city during the Holy Days, used to preside over occasional cases that came to him. Tsedahh knew nothing of Roma, not even that Pilatus happened to be in the City for the Sacred Passover observances, his presence affording the chief priests of the Temple and their Pharisee supporters the opportunity they desired to settle a worisome thorn in the flesh--the latest Messiah-claimant called Yeshua of Nazareth. Empowered under Roman law to try him in a Jewish court for blasphemy, yet they could not exert the full force of Jewish religious law in putting him to death, the Romans having taken that power away in their subjection of Judaea. But the procurator, they had determined, could be made to condemn the claimant and crucifiy him in their behalf, given sufficient provocation. So they had, during the night seized the claimant and declared him a blasphemer at a secret trial before the Jewish Sanhedrin, the highest Jewish court. That was the first step. The next was to present him before the Roman with a trumped up but believable charge of insurrection--the Romans were always very sensitive on that score, they knew. The night had been a busy time for many leading Jews and Romans, not to mention “King” Herod the Tetrarch, who was also in the city for the Passover. Something the Jewish authorities could not prevent, Yeshua had been passed back and forth, Herod playing the game so adroitly that the Roman ended up with the decision. Pilatus was to finish the case in the Pavements, whether he was innocent and should be set free, or whether he was a dangerous malefactor and should be crucified with some criminals already in the dungeon for murder and insurrection against Roman rule. The Passover was fast approaching when Pilatus, heartily sick of the whole business and warned by his wife not to harm the defendant, appeared in the Pavements and took his seat. The accused, wearing a purple robe and a crown of thorns that Herod and Pilatus’s own soldiers had thoughtfully provided, was brought out under heavy guard. Tsedahh, without knowing what was happening, was swept into the court with a crowd that contained Pharisee ringleaders. Before Tsedahh could leave, he heard a mob of agitated people begin to chant “Crucify him! Crucify him!” on cue from the leading Pharisees and Sadducees. The judge in the red-bordered white robe stood up, conferred with the plaintiff on a point or two, then sent him away under guard and later brought him back, his shoulders and back torn to bloody shreds. “Behold the man!” the judge declared, but the crowd did not relent as Pilatus hoped and chanted “Crucify him!” all the more. Even then, Pilatus was resourceful. He had another trick up his sleeve. A condemned criminal was brought out, and the crowd was offered a choice. Yeshua or Bar-Abbas. By custom of favor shown by the procurator during a festival, the people’s choice would be set free. “Bar-Abbas!” the crowd cried. “We want Bar-Abbas!” So the murderer and insurrectionist was released to them, and Yeshua remained. Now what to do? Pilatus was stymied, and he hated being forced to do anything against his will by detested inferiors. After this the Roman with his back held ramroad straight strode off and the trial was at an end. Tsedahh was not surprised when a cross was brought out by the Roman guards and laid upon the claimant’s shoulders. The guards led Yeshua away, with the crowd following, hurling every kind of oath at the condemned man along the route to Golgotha, the Hill of the Skull just outside the city wall. Horrified, though he had never seen an execution nor could fathom a Roman crucifixion, Tsedahh soon found himself outside the city with the others, staring aghast as the Roman soldiers expertly did their job, taking iron spikes and nailing the claimant’s wrists to the crossbeam, then nailing his feet to the bottom of the upright beam, before setting the cross in a squared incision in the ground, which was solid granite on the top of the hill. Tsedahh was weeping now from shock and grief for the man as well as with the loss of the holy tree. “This cannot be!” he cried silently, but his eyes said it was, and there was no turning the course of things. Surely, the man would suffer hideously on the tree! Since men were mortal and could be killed in the body, would he not die there also? The Ribbon-Bearer, bereft of both ribbon and tree, found himself pushed forward in the crowd. Thrown to the ground at one point, Tsedahh gazed up and his look of horror was returned by one of infinite love from the face of the condemned man. Yeshua was not the only one condemned and crucified that day. On each side hung a thief. Both had been caught robbing the high priest Caiaphas’s granary, stealing the oil and the grain at night, and Caiaphas, with no power to carry out his sentence of death, had turned them over to the Roman Pilatus, who was only to happy to execute Jews. The thief gathered his spit and was close enough to spit on Yeshua, which he did. Yeshua did not react, except to cast a forgiving glance his way. Tsedahh got to his feet and was pushed on back down the hill, without putting forth any resistance. Sickened and distraught, Tsedahh could see only his abject failure and that look of infinite love. In his wretchedness he scarcely felt the first quakings of the earth, nor did he make anything of the darkening of the sky before it was time. As for the two thieves, they still lived, but the Roman guards were growing restless, and they went and broke their legs so they would not be able to get their breath and die quickly. Later, while Yeshua’s body still hung on the cross, two-dressed men came creeping up the hill, carrying a heavy bundle, and they laid it down and said something to the guards, who released Yeshua’s body to them, which they carried along with the bundle to a tomb below the hill. Tsedahh turned back to the cross. Three crosses stood on the hill, but he felt without any question in his being that Yeshua had died on the one God had caused him to put the ribbon upon. The Ribbon-Bearer went to Yeshua’s blood-stained cross, which now lay where the guards had left it. He watered it with the first tears any creature of heaven ever shed, before he even touched it. Then he reached out and his hand touched the crimson-stained wood of the despised dogwood. Instantly, Tsedahh felt flooded with the glory of God, stronger than anything he had witnessed in the second heaven. Unspeakable fragrance and beauty poured out from the living wood and into Tesedahh. He could not contain it, rising rose skywards, his travelling mandorla shining as brilliant as the sun, even more resplendent in the darkened sky. He felt called heavenward at that moment, for Earth must not see so great a splendor before its time, before the Lord’s Second Coming. But not only was Tsedahh made to vanish in an instant, the Cross rose skywards with him, wreathed in immortal leaves for the Healing of the Nations, with white blooms of purest radiance shining clustered thickly on its outstetched cross beam. In heaven it would stand towering, and the Crystal River would run through its base, so that stood on both sides of the stream. Together, Tsedahh and Cross burst through the Universe and entered the second heaven, where the Tree of the Healing of the Nations stood beside and over the crystal river that flows everlastingly from under the Throne of God, and by its right side Tsedahh alone was given a place to stand, while above them newly-birthed royal stars of the first magnitude sang praise for the Crucified and Risen Lamb. “Hunter of Food” had found the tree that furnished bread from heaven to all mankind. For his role the least gained a seat of honor beyond that of Michael and Gabriel. He might have stayed there, enjoying eternal bliss, but he felt something was lacking. “What could it be?” he wondered. Suddenly, he knew. The ribbon! He had left it behind without a thought! The Tree of Heaven must not be complete, he thought, without the identifying ribbon.